It seems every NCAA story I write revolves around coaches on the hot seat in the SEC, but you have to go where the news is. In my Week 6 Opening Line Report on Monday , I mentioned that BetOnline had a prop up on the next coach at Tennessee - presuming Butch Jones is fired after this disappointing season. "If I intended again to coach that would have been part of my statement," Stoops said. "I would have said I'm stepping away here now for this time for myself, but when it comes to the next year or two, I look forward to getting back in it. … But that's not what I said. You won't see me on a college sideline or a pro sideline. A lot of people act like they know, and there will be more than a few jobs out there. But that isn't at all what I'm looking to do." I know what you are thinking: Guys say this all the time. But it's not like Stoops was forced out. He could have coached at Oklahoma for as long as he wanted. When you hear rumors about someone like Jon Gruden, that's different because he was fired by the Tampa Bay Buccaneers. No.3 Oklahoma frankly hasn't missed Stoops as the Sooners are 4-0 under Lincoln Riley and 27.5-point favorites Saturday against visiting Iowa State. That could be a trap game for OU with Texas up next in the Red River Shootout. LSU at No. 21 Florida (-3): Speaking of coaching hot seats, that of LSU's Ed Orgeron is boiling after last week's embarrassing 24-21 loss to little Troy of the Sun Belt Conference. The Tigers paid the Trojans $985,000 to come and beat them on Homecoming. It ended LSU's 49-game home winning streak in nonconference games (two shy of Miami's record) and 16-game streak on Homecoming. LSU clearly made a mistake hiring Orgeron but can't really fire him considering the guy has a $12 million buyout -- why would LSU give him that when no other schools were interested? This week, Orgeron and under-fire AD Joe Alleva met with both coordinators, Matt Canada (offense) and Dave Aranda (defense). That's a little unusual an AD getting involved with coordinators. They say everyone is on the same page. Yeah, right. Two key LSU starters who missed the Troy game returned to practice this week and are looking good to play vs. the Gators: running back Derrius Guice and defensive end Rashard Lawrence. UF leading receiver Tyrie Cleveland, who caught the Hail Mary in the Tennessee game, will not play due to a high-ankle sprain suffered last week vs. Vandy. QB Luke Del Rio suffered a season-ending broken collarbone in the game so it's Feleipe Franks back under center. Del Rio had just replaced him as the starter. Michigan State at No. 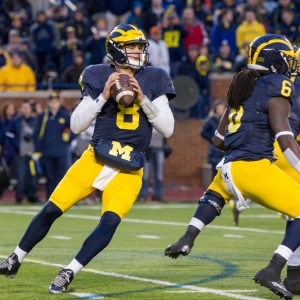 7 Michigan (-10.5): This opened at -12.5 and the total has dropped from 44 to 39.5. Both moves are likely because U-M coach Jim Harbaugh finally told the world what was going on with starting QB Wilton Speight: He's going to miss at least a few weeks with an undisclosed injury (of course Harbaugh won't share that) suffered Sept. 23 vs. Purdue (Michigan off last week). Former Houston transfer John O'Korn gets the start. He took over in the first quarter against Purdue and went 18-for-26 for 270 yards with one touchdown and one interception. You may remember the last time MSU visited Ann Arbor two years ago and won by returning a flubbed Michigan punt as time expired. That was a huge mistake by Harbaugh to even kick the ball. Sparty has won seven of the past nine in the rivalry but lost last year and, frankly, the Harbaugh hiring has changed this series hugely in favor of the Wolverines. No. 11 Washington State at Oregon (+2.5): Things are different in Eugene these days as Oregon never used to be a home dog. This total has dropped from 65.5 to 61. The Ducks have lost quarterback Justin Herbert for at least a month to a fractured collarbone. He was injured early in last week's 45-24 win over Cal. Herbert was having a good season, completing 68.3 percent of his passes with nine touchdowns while rushing for 116 yards and two scores. I'd like to tell you who will be starting under center here, but Coach Willie Taggert is keeping that close to the vest between redshirt Taylor Alie and third-string true freshman Braxton Burmeister. Alie replaced Herbert vs. Cal but was injured in the fourth quarter, not seriously. He has thrown 34 career collegiate passes. Burmeister attempted his first (and only) career pass in that game. Top running back Royce Freeman also left vs. Cal but has practiced this week. The Ducks lead the nation in scoring at 49.6 points per game. Wazzu has won the past two meetings and averaged 48 points in them. SMU at Houston (-6.5): Houston opened at -9.5. Important game in the AAC's West Division as the loser is unlikely to win the division and play either USF or UCF in the conference title game. Houston still has to play South Florida and West leader Navy, while SMU still has Central Florida and Navy. The big news here is Cougars sophomore defensive tackle Ed Oliver, maybe the country's best defensive player and a rare five-star recruit to no sign with a Power 5 school, being listed as a game-time decision with a knee sprain. Oliver, who was selected All-American as a true freshman, was hurt on a low block in the Cougars' 20-13 win at Temple last week. The future NFL first-round pick has 23 tackles and 3.5 for loss this season along with two forced fumbles and a blocked kick. SMU is one of only two FBS teams (UCF) to score at least points in every game this season. The Mustangs have scored in every quarter (that's impressive) and are third nationally in scoring (48.2 ppg). SMU upset then-No. 11 Houston 38-16 last year.